There are just hours to go before the big football match in London but we’re not talking about Arsenal’s Champions League clash with Olympiakos. Tonight is the battle of east London, a fight between neighbouring boroughs, a clash of the titans! While most eyes may be on the goings on at the Emirates Stadium and other grounds around Europe, there promises to be just as much excitement, action and entertainment at the Old Spotted Dog Ground, home of the once-mighty Clapton FC in east London, which will host the first-ever senior league fixture between Newham's London APSA and Sporting Bengal of Tower Hamlets, two of the country's pioneering and premier Asian football teams. The duo have played each other on countless occasions, from the Asian Leagues and UK Asian Championships and even the FA Cup as they looked to combat the notion that Asians don't like football. Tonight is a special night for them as it will be their first clash in the Essex Senior League, which, for those who are wondering, is five leagues away from League Two. For those who follow the plight of Asians in football, you will know that APSA v Bengal is always an exciting affair, with their most recent match regarded as a classic as it finished 4-3 in favour of APSA in the replay of their FA Cup extra-preliminary round clash in 2007. The two teams have come a long way in their relatively short histories to showcase Asian talent in the local communities as well as fully embracing the beautiful game and all that it brings at the grassroots. London APSA hail from Newham and are the older of the two clubs, having established in 1993. 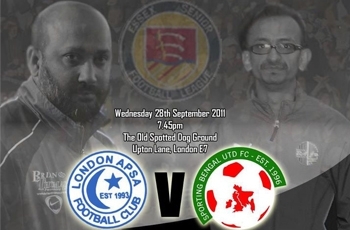 Three years later, Sporting Bengal arrived on the scene in Tower Hamlets. In a unique set-up, the team is made up of the best players from the Bangladesh Football Association UK (BFAUK) league which is home to nearly 30 teams in the borough – plenty of players to choose from and plenty of headaches when it comes to selection as well for the manager! Over the years, both teams have dominated the Asian football scene and eventually decided to step up to the plate, so to speak, and join the national football pyramid. While APSA joined up with the Essex Senior League, Sporting Bengal decided to aim for the Kent League Premier Division, a strange move considering they're situated north of the River Thames and, well, teams in the Kent League are usually based down south. Both teams will have a number of star names on show, including former Wycombe Wanderers striker Shahed Ahmed, who will captain Sporting Bengal against his former club. The 26-year-old is a rarity of being one of a few Asian players to have played professional football. "I'm very excited and feel privileged to be captain of Sporting Bengal in such a big game. I have been lucky enough to play for both teams and have many friends at APSA. I'm expecting it to be a tight footballing game and if the previous encounter (where APSA won 4-3 in the FA cup) is anything to go by then I'm sure all fans and spectators are in for a treat. It seems after many years of inconsistency with players that both teams have finally got their best squads so I feel the time is right for this game. There is a real buzz in both camps and confidence is high." "I'm hoping the game is played in the right spirit and of course that Sporting Bengal win. In saying that, I hope after the 90 minutes tomorrow, both fans and players go back to supporting each other because certainly from my perspective I wish both teams to do well in the Essex Senior League." While it may not be a glamorous tie played in front of big crowds, the fact that both clubs have overcome many obstacles, not least the lazy stereotyping and preconception of Asians and football. And the home side have even lowered ticket prices to just £2.50 to attract a big crowd. For once, maybe it might just be worth catching the highlights of the Champions League and catch APSA's very own version of Leo Messi in winger Yasin “Titch” Patel or Bengal's hotshot striker Javier Rivera, who scored a hat-trick against Sawbridgeworth Town in the FA Vase on Saturday.